First, my work for Gospel nonviolence began in 1982, while I was camping alone by the Sea of Galilee in Israel. I was twenty-one years old and about to enter the seminary. One day I visited the Chapel of the Beatitudes and was quite overwhelmed by their teachings. While pondering them, I saw Israeli jets swoop down over the Sea of Galilee, and drop their bombs a few miles away in Lebanon. Sixty-thousand people died during that summer war. I decided then and there to dedicate my life to the Beatitudes and the Sermon on the Mount. Within months, I began a serious study of nonviolence, joined every peace group I could find, and started writing a book about professing a vow of nonviolence, as Gandhi did. Since then, I’ve written over 30 books on peace and nonviolence; traveled the war zones of the world, from Central America to Iraq and Afghanistan; organized countless demonstrations; been arrested over 75 times and spent nearly a year in jail; directed the Fellowship of Reconciliation USA; lectured on nonviolence probably to over a million people, and currently work with Ken Butigan on Campaign Nonviolence. Second, Gandhi and King insist that nonviolence is power, that it is stronger than all the world’s weapons combined, that it doesn’t use the means of violence to achieve noble ends, and that when it is tried, it always works. I see this more and more as I study the movements for social change. 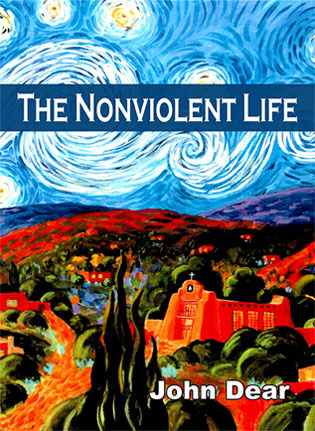 As I wrote in my recent book, The Nonviolent Life, I think nonviolence requires nonviolence to ourselves; nonviolence toward all people, all creatures, and all creation; and at the same time, active participation in the global grassroots movement of nonviolence, which can tackle any issue, according to Gandhi and King. Erica Chenoweth, in her recent book, Why Civil Resistance Works, has now proven statistically that nonviolence works when it’s tried. But for me, its greatest strength, of course, is that is it the way of Jesus. I completely agree with Gandhi and King that Jesus was perfectly nonviolent, that all his teachings are about nonviolence, that he forbids all violence, and that during his life, he built and mobilized a grassroots movement of nonviolence, which continues today. As I get older, I have become less involved in institutional church work and more involved in global grassroots movements of nonviolence, because I think this is what the nonviolent Jesus wants of me and all of us. I’m very moved too by Gandhi’s statement: “The Kingdom of God is nonviolence.” We are working to welcome the Kingdom of God as a new world without war, hunger, guns, greed, executions, torture, racism, sexism, nuclear weapons or environmental destruction, a new world of nonviolence. Third, Catholics do not know anything about nonviolence. They do not know that Jesus was nonviolent. They all support violence and war. At best, they compartmentalize their spiritual lives from the world’s realities of war and violence. The Church has to reject the just war theory once and for all, and start teaching the nonviolence of Jesus and the methodology of nonviolence. In particular, priests and bishops need to be taught about Gospel nonviolence. This is the most important work we can do together, and why this Rome meeting is so important. This meeting has to be just a beginning. Ideally, I hope we can push Pope Francis to write an encyclical on the nonviolence of Jesus, the rejection of the just war theory, the church’s complete embrace of nonviolence, and the requirement of every Catholic to try to practice the nonviolence of Jesus. Because we are a hierarchical church, I suppose we need to push Rome toward the truth of Gospel nonviolence. We may never have a better chance than under Pope Francis. I hope we can ask for a second meeting, in a year or two. I certainly would be willing to help in any way. John, you are a great gift: to humanity, to the true message of the Gospels, and to so many who have been inspired by your work, your writings, and your selflessness. Keep going, Brother!